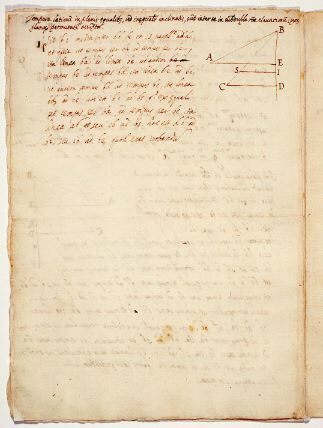 Comments Written by Guiducci with an addition by Galileo; contains texts, drawing. Copy without original. Relation to the Discorsi: incomplete draft (statement) of 2/04-th-04; elaboration of 2/04-th-04. 1 Sit bi media inter db, be, et is parallela ad dc; et quia ut tempus per ba ad tempus per be, ita linea ba ad lineam be; ut autem tempus be ad tempus bd, ita linea be ad bi; ut autem tempus bd ad tempus bc, ita linea bd ad bc, hoc est bi ad bs; ergo, ex aequali, ut tempus per ba ad tempus per bc, ita linea ab, seu cb, ad bs, hoc est db ad bi, seu ib ad be: quod erat probandum. 2 Tempora lationum in planis aequalibus, sed inaequaliter inclinatis, sunt inter se in subdupla ratione elevationum ipsorum planorum permutatim assumpta.